Very glad you enjoyed the Harry Potter books, this post has made me want to read them all again! To my surprise, Pottermore put me in Slytherin. I was sure I’d be a Hufflepuff or a Ravenclaw! If Pottermore had put me in Slytherin I would have fallen out of my chair in shock! I don’t know, the Snape scene wrecked me in the movie, and the book too. I guess I just am a softie after all. And yes, he was such a jerk to Harry, but I think it was because he saw so much of Harry’s dad in him and Snape couldn’t get over it. So, conflicted feelings. I give him a pass, but totally see your point of view on it. And I love Luna — she’s one of my favorite characters and I always wanted more! I think I need to re-watch the movies now. Yay for Hufflepuffs! I think the biggest hesitation I actually have is those house colors. :/ Oh well. And now that I’ve read all the books and seen all the movies I definitely need to go to Harry Potter world! They are bad colors. I so agree. And you should go if you get the chance. It was fabulous. I would love to be able to go back and experience the Harry Potter books for the first time! I remember getting HBP at a midnight release party and finishing it before the sun had fully risen. Deathly Hallows I probably read in one sitting. Which, looking back at how long the book is, I don’t even know how I did it! Just INHALED it, basically! The camping didn’t bother me the first time for the same reason — I was reading so fast I didn’t notice. It’s only upon rereading the books that I’ve come to understand what people mean about the first few hundred pages dragging … but, man, once they get to Hogwarts it’s a full-on adrenaline ride right to the end. I also TOTALLY agree with your less than shining assessment of Snape. That he did everything out of (unrequited, unreturned) love for Lily I guess explains his motivations to protect Harry, but it doesn’t excuse that he was a grown man, in a position of power, bullying children day in and day out. I get where Snape fans are coming from, but I just can’t excuse a teacher ever treating a student the way Snape treated Neville, for instance. He’s a fascinating character, but not a good guy! That is some crazy fast reading! And I’m glad someone agrees with me about Snape! I have loved Harry Potter for such a long time now. I grew up with the books and the anticipation for every new released book and movie, so it holds a special place in my heart. I thought the ending of the series was simply the best. I couldn’t have asked for a better way to conclude everything 🙂 I’m a proud Ravenclaw member! I always get sorted there and I think I would be in the right place. My favorite character has always been Snape (I know, I know) and I also adore Hermione because who can’t relate to her? Luna is adorable too and I totally shipped her with Neville in the movie too! I can definitely relate to Hermione as I was always the one studying all the time! Aww, so wonderful that you’ve gotten to the end – and I’m happy that you were able to read Deathly Hallows in a short amount of time – I think it mirrors most people’s reading of that book. I just kept reading too – it was a long time to wait for the final chapter. But I agree that it was totally satisfying, especially with the character development! Sheesh, did it used to sort everyone into Slytherin, I wonder? I can definitely see you as a Ravenclaw though! I actually never wanted to read Harry Potter! But, for lack of books I read the first book once, and completely got hooked to it! I went through the books really fast and then when I came to the Deathly Hallows, I just couldn’t find it anywhere. Luckily the local library had the book lying in an abandoned rack and I found it. I finished it off in 5 hrs or so! The movies were great as well! I went on to Pottermore with two accounts by accident. In one of them, I turned out to be Slytherin!!! I paid more attention in the second one and answered more truthfully, and the Sorting Hat said Gryffindor!!! That’s why it took me so long to read it too, I never had a strong interest until recently! And you read DH almost as freakishly fast as my friend, ha ha! Oh, I’m tempted to try the second account, just to see, though I feel like I was pretty truthful! I might change one or two answers though. *high five* I’m a Hufflepuff too! Nothing wrong with that 😉 Honestly, I can’t pick a favorite character. I love the trio of ladies though: Ginny, Luna, and Hermione. All of them are so distinct from each other, but I just love their personalities! I never fell in love with Ginny, but I love the other ladies! And Mrs. Weasley! She’s awesome! Did you see the other day where JK apologized about Fred?! It was sad, I mean, they belong together! And that shop was great! I am so glad you loved the series. I agree that I didn’t really catch the “always” that some people made so important. But it is cute when put out there by itself. I read these over and over because I loved them so much. I’m glad I’m not the only one who didn’t really catch it! I probably would have glossed it over completely had it not already been a well-known line. Have you read books 1-6 since then? 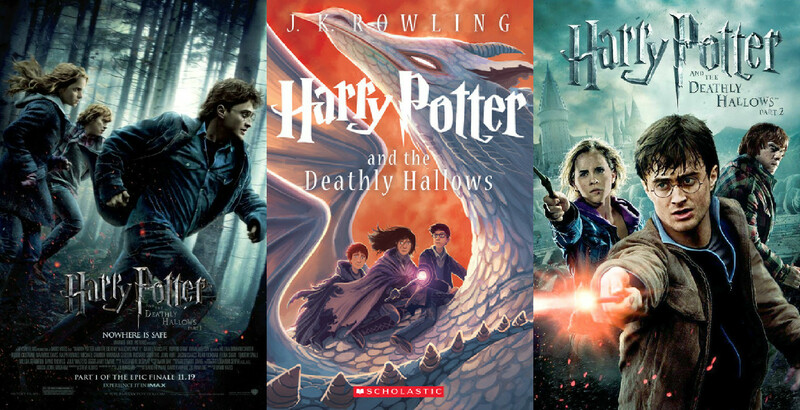 Even though The Deathly Hallows is my favorite it’s definitely worth reading the others! Ahh, yay! I’m so glad you loved it, it’s such a fantastic conclusion to the series. Deathly Hallows is my favorite too(looking at your list, I think we rank the books in similar, but not identical orders. For me, Azkaban is 2nd only to Deathly Hallows, then GoF, and Order of the Phoenix is my least favorite–it’s the only one I have any actual writing issues with). Pottermore sorted me into Gryffindor, SEVERAL times because I refused to believe I could be anything but Ravenclaw(which is kinda funny to think about because stubbornness, while of course not limited to one house, is definitely kinda a Gryffindor quality). I think I ended up with 5 Pottermore accounts and every single time I got Gryffindor except once, and that time was Hufflepuff, which was laughable(not because I am anti-Hufflepuff! Hufflepuffs get a bad rap. I am just SO NOT ONE. Like, out of all four houses, it is the one I think I would put myself in last). So, I’ve embraced my Gryffindor side now. PS–sorry if this was a duplicate comment, I tried to comment a minute ago but the button never got past “posting comment”, so I don’t think it did, but sometimes wordpress can be tricky with things like that, I know. Looks like you’re good on the comment, though I understand; I hate when it does that! Being a Gryffindor would be great! I think I have a little of that in me (in fact I have been sorted that way by one quiz) but I’ve got a lot more Ravenclaw and Hufflepuff! THIS POST GIVES ME LIFE! You know I finished the books at the very end of last year and I started the movies during this past semester…but never got far. I honestly can’t even remember what movie I’m at, but it’s not far. But your reaction to the last books were like mine (I went to Pottermore straight away too….Hufflepuffs unite! Also, I reluctantly claim it too). Like I said, I haven’t watched the last movies, but I’m looking forward to it. My plan is to knock it out this summer! The characters are just fantastic, I want to hug them! 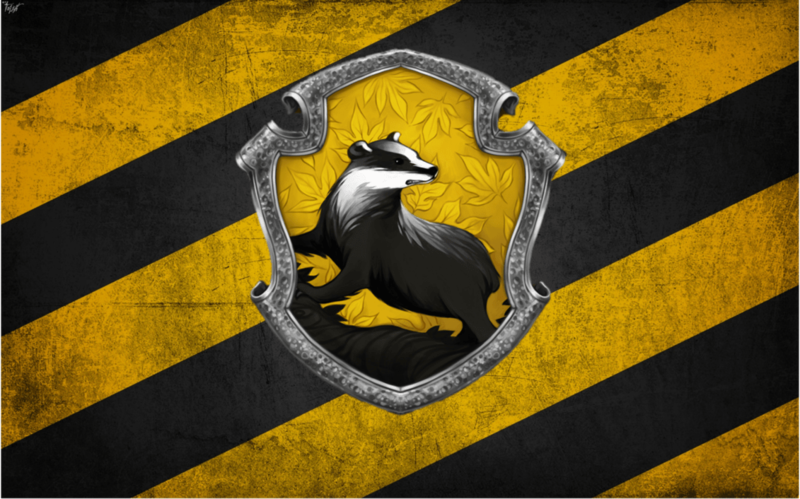 After seeing how many blogger friends are Hufflepuffs it makes me happier! So yay, Hufflepuffs unite! The latter movies really are better than the earlier ones, but especially those last two! Can’t wait to hear what you think of them! the only reason I got the Snape lines because, and I don’t remember which book this is in, but Tonks patronus changes after she falls in love with Lupin. So his patronus being a doe said what a lot of the words didn’t. But yeah, even though you come out the end seeing Snape differently than expected, he was still a jerk. He did good things too that were often misunderstood. But sometimes he also just did mean things and that isn’t explained from a different perspective or undone. Oh, but I totally like him better because he’s Alan Rickman!! So, the actor makes me like the character quite a bit more. I liked in the movie when they added one word from Dumbledore just to make the “Always” thing clearer, which is he first asks, “Lily?” before saying, “After all this time?” I just would have appreciated that in the book.